I love circle vests! They’re such a fun accessory. 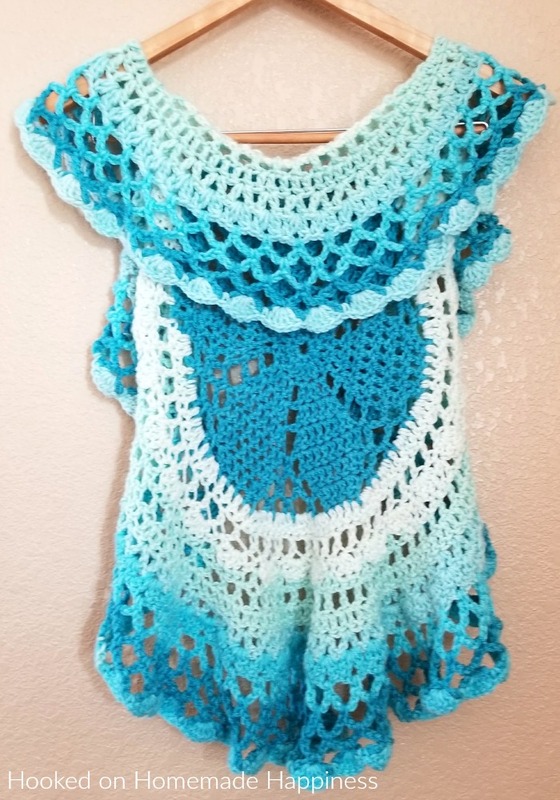 For this Crochet Circle Vest Pattern I wanted to use a Caron Cake. Because who doesn’t love stripes without weaving in all the ends, amiright? Of course, I had one laying around, just waiting to be used and it turned out to be the perfect amount of yarn to make this circle vest! I used almost exactly one cake. So if you crochet loosely, or up a hook size, one cake may not be enough. 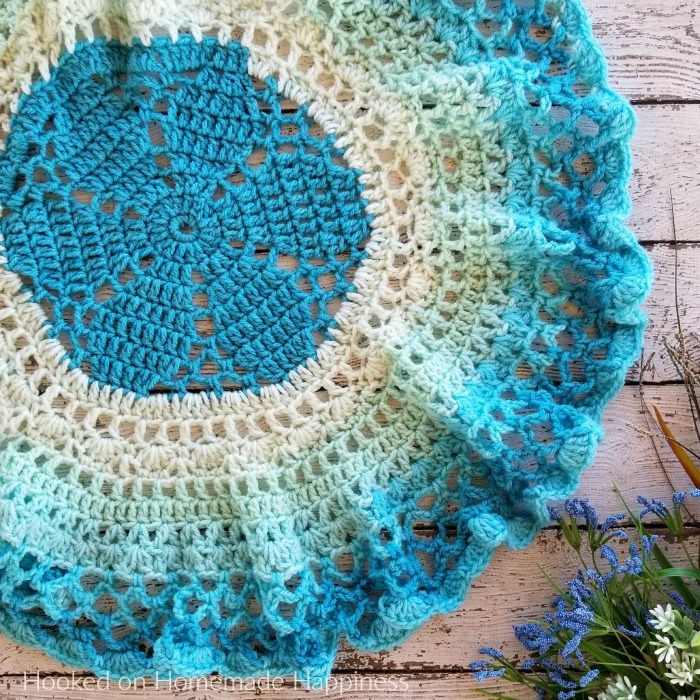 The vest starts with this pretty flower center! I love this fun detail. Then the edges are pretty and flowy. Because of the flowy deisgn, this vest will fit a range of sizes. It has fit my 6 year old for about a year now, and it also fits my 8 year old! 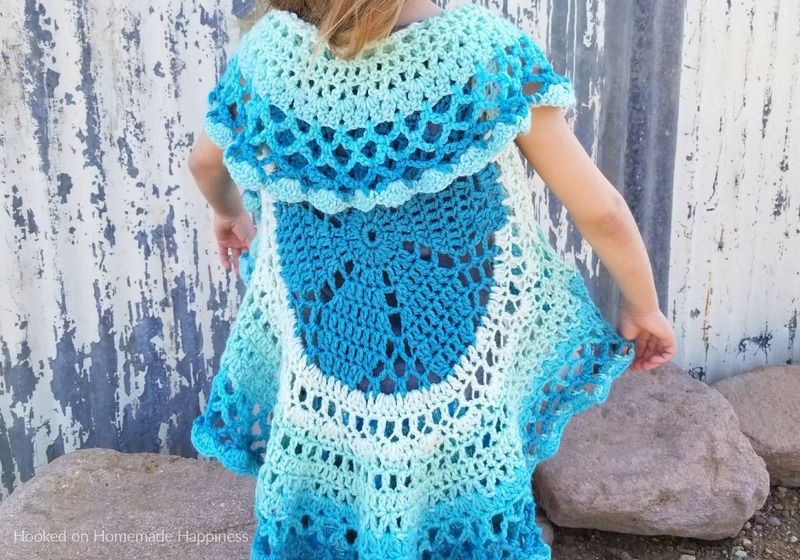 – Get the complete free pattern below or this pattern is also available as an inexpensive, clearly formatted, PDF instant download in my Etsy Shop or in my Ravelry Shop! **You’ll create the armholes in the next round. The number of stitches between the armholes can easily be adjusted. And you’re done! 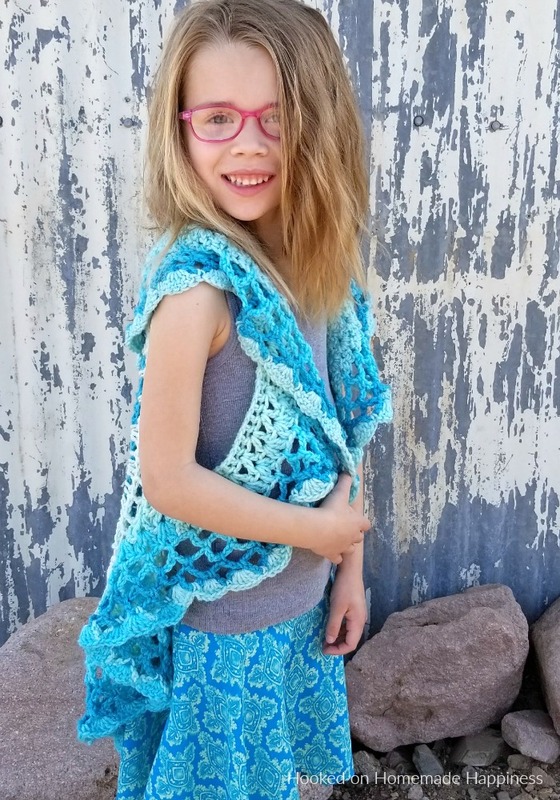 I hope you love this fun circle vest! This is so cute! I started knitting around a year ago and have not gotten around to crocheting yet. My boyfriend knows how to crochet and is currently making a stuffed animal! Thanks! I never learned how to knit, but it’s something I’d love to learn. I am having trouble with rnd 12. If I skip a stitch sc in next 3, there is no stitch to skip before the sc of previous row. Aw, man! That’s because I made a mistake in row 11. >__< Each shell (in row 11) should have 5 stitches, (hdc, 3dc, hdc). I'm so sorry, Brenda! I've updated the post. That’s fine. We are all only human. Love this pattern by the way. Should row 7 have 48dc when we have dctog in this round? I have 36 and just getting confused. Thank you. I was able to get it. I’m having trouble with row 11. You’re right, that is wrong. It should be 29 shells and 29 sc. I’m out of town right now so I can’t double check, but if I’m thinking correctly, 29 & 29 should work. I hope that helps. So sorry about that ? I am totally confused with row 16. Can you please give me some help with this. How do you dc2tog in the chain one space? Help😊 i am new to crocheting. In round 10, I come out with only 57 dc, so the shells are not spaced properly. Am I missing something? Thanks. I counted that first ch4 as a dc and got 58 stitches but still can’t get the shells to space properly ? Hello! Are you counting the first ch 3? I’m out of town at the moment, so I’m not able to double check it ? Yes, I am counting the first chain 3. I tried adding two extra stitches in row 9, so I did get 58 dc in row 10, and the shells worked in row 11, but then row 12 didn’t work. I have quite bit of yarn left over. I’m glad it’s pretty! I just remeasured mine (after scouring the girls’ room for it! ;D) and it’s about 29 inches long. You could just repeat the netting in the last rows until it’s the length you like and then do the row of shells. I am stuck on row 16. It says to dc2tog. Should it instead be 2 dc in the same space? Or am I to make 2dctog in the space instead of doing it over 2 stitches? I do not get row 16 at all. Do you do all the directions from the start to finish. slip stitch every time to chain 1 and do both groups of stitches in parentheses or just the 2nd group? How do you do a dc2tog without using 2 stitches? Sorry I am so confused. Hi! No, don’t slip stitch each time, just the direction between the ( ). Dc2tog is in the chain space, not over 2 stitches. Hope that helps! I don’t understand what i am to do this round. I am afdaid i am quite confused about what i am to dc2tog in tne ch1 spaces. Can someone explain this to me, please? Work 2 double crochets together in the ch 1 space. Both stitches will be in the space. I also am very confused about round 16. I know how to dc2tog, but what stitches do i do it with? How do I do this all in the chain 1 space? Any advice how to do this? Yes, do the first step of 2 dc, then pull through 3 loops. Any tips on picking a cake that will have enough to do the whole flower Center in one colour? I tried it in the purple one and it only did half. Thoughts? Hi Skye! I would look for a cake that has a big chunk of color in the center. Also you could cut off that first color right where the second color starts, then you know you have a big chunk of one color to work with. Then add the color you cut off to the end. I’ve cut through cakes to get the colors I want many times 🙂 Hope this helps! 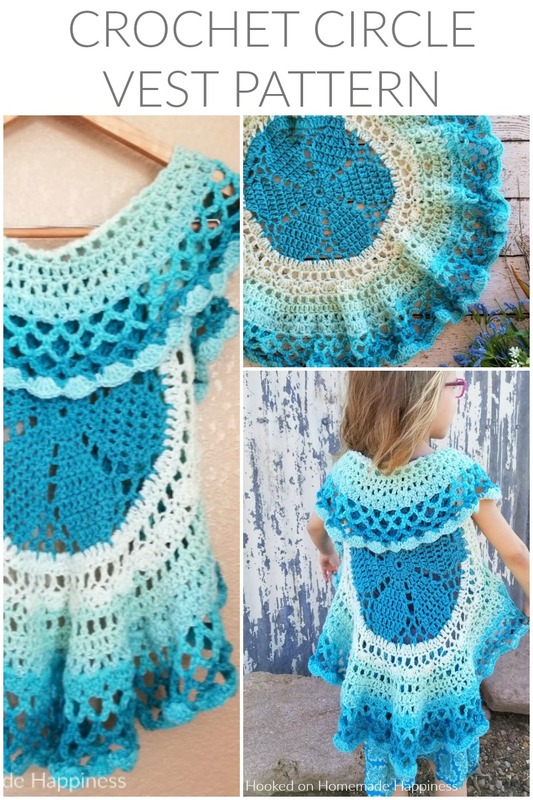 I ABSOLUTELY love love love this pattern , wish you had adult size . I made 2 of these . One I made with Caron Cakes and the other I made with Hobby Lobby’s “I love this cotton”it came out beautiful! This pattern wS extremely easy to follow and it worked up very quick . Thank you ! I just finished my first circle vest. I love this pattern! It worked up really quick.! I plan on making 6 more. We have 7 granddaughters. I have already started on the second one. I am currently working on this using mandala yarn and it is beautiful. Just wanted to the last row to go. I modified d a little though because my cousin decided it should be for her and it was a little short and I still had plenty of yarn so I added a few of the netting rows and then done a row similar to the one with the dc2tog stitches and then another row of the netting to finish the last row. What size is the finished product. From the picture it looks like a 4 or 5T. But I just have the last to rows to finish and it looks more like maybe a 2T. I’m use it a size H hook. This vest fits both my 5 year old and my 7 year old. What are the measurements between the armholes? Maybe a typo in Row 11? ” *(hdc, 3dc, hdc) [in all in next] dc “?? Hi 😊 You should have a dc in between the shells from the previous row, then sc across 3 stitches of the she’ll. Hope this helps! Hi, love the patter but am I missing something? 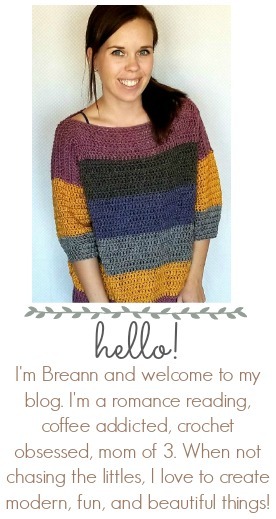 Are you crocheting in the ch 2 space as well? Hi 😊 For which row? Should there be the same number of rows between the two arm holes top and bottom? I am enjoying this pattern, however I am a little confused about row 12. The pattern says to slip stitch to next stitch after the join. Exactly what stitch am I to slip stitch to? The stitch right next to the join 🙂 This is where the round starts. So instead of cutting the yarn and rejoining one stitch over, just sl st into the very next. Hope this helps! Thank you for this beautiful pattern. I do get 11 inches between the arm holes, but only around 22″ in diameter. (Used Bernat Pop & 5.5mm Hook) Will go up one hook size and add a row or 2 more before the last row of shells. Otherwise, very well & easy pattern to follow. About to start making the third one for my mini me! Really easy to follow pattern and so beautiful!! That’s awesome!! Thank you so much!! How could I make this fit a larger size? I’m using a thin yarn with a j hook. It looks beautiful but the size is smaller then a five year old. Also interested in adult sizing. Hello! I’m loving this pattern!! On row 13, after I’ve done the second armhole (ch24, skip 24 stitches, dc in next) it says *ch1 skip one stitch* repeat from * to *…..what does this mean? What am I doing after I skip one stitch? Is it supposed to be like it is in between the arm holes (ch1, skip 1, dc)? Please clarify this for me! This is my first one and I’m hoping to make one for myself as well! 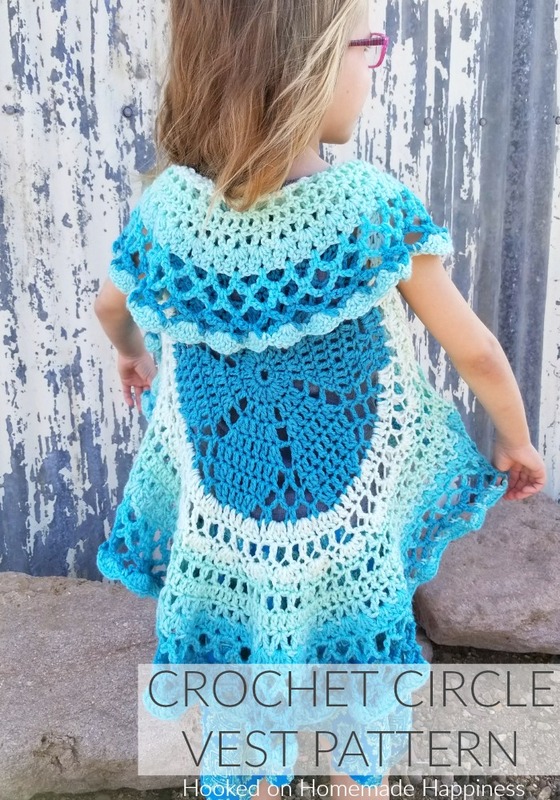 How can I make this for a 12-24 month size? Hi, I’m having trouble with Round 9. For some reason I keep getting 108 as my final stitch count for the end of the round instead of 114. I’m sure I followed the pattern correctly up until this point. I can’t figure out why this keeps happening. Hmm, not without seeing it I’m not sure. I figured it out. For some reason I did round 6 twice and it got messed up that way. Everything’s good now. Thanks. I’m down to the last row! How did you do the shells? Thanks!